December 15th: McKenna shot a short film written by PeterPaul Shaker called Game Ready. She played, Kelly, a nurse who is the down to earth, cynical sister of the main character, Tyler, who is trying to become a professional gamer. December 14th: McKenna performed with Room 28 Comedy in a holiday sketch comedy show for Meredith Publishing! December 14th: McKenna shot a promo for Piro, a branded entertainment, content and storytelling creative and production studio with director, Tim Piper. December 3rd: McKenna was in a reading of Jane Elias’s full length play, Girl Is Mine, at the Teatro Circulo. The reading was part of the First Mondays Reading Series through Naked Angels. November 17th: McKenna performed in two variety shows with an all female cast and crew in Comedy Derailed at the Triad Theatre! November 6th: McKenna was in a reading of Bunnies by Joanne Hoersch through the Writer’s Theatre of New Jersey at Drew University. October 29th: McKenna performed at UCB Hell’s Kitchen theatre in a show featuring Hunter Nelson’s 301 Sketch Writing class! October 26th: McKenna was a producer on set for an internal video for Regeneron, an award winning biotechnology company. She collaborated with Spicy Pepper Media for this project. October 25th: McKenna booked and filmed Jacqueline Christy’s amazing, new feature, Magic Hour. She plays a young woman who has a panic attack at a business meeting. October 24th: McKenna filmed a promo for the Oxygen Network’s new show, Smiley Face Killers. You can view the promo poster below. October 21st: McKenna filmed Episode Two of the Open House Web-Series with Indelible Films. October 19th: McKenna’s sketch comedy team came out victorious in Bragging Rights at the PIT Loft for the PIT’s 2018 Sketchfest! October 15th: McKenna performed with Room 28 Comedy at NBC for the Telemundo, Bravo and various advertisement agencies. October 12th: McKenna performed with Room 28 Comedy at the Triad Theatre! October 10th: McKenna performed with Room 28 Comedy at 30 Rockefeller Center for NBC in honor of Hispanic Heritage Month! October 5th: McKenna filmed a pretape for SNL where she played a Texan at a Ted Cruz rally. She loves watching Oz Rodriguez direct his amazing cast. September 29th: McKenna played a Burger King employee on SNL! She had a blast being a part of the live show and watching the cast and crew knock it out of the park. September 21st and 22nd: McKenna booked and filmed a commercial and print job in Albany for SEFCU! September 7th: McKenna performed in the hilarious sketch comedy show, Bragging Rights, at the PIT Striker! August 18th: McKenna had a blast performing in UCB's Sketch Cram at the new Hell's Kitchen theatre. For this show, the writers get together at 10AM and create eight sketches. The actors arrive at 6:30PM, learn and rehearse their scenes, and then perform the show at midnight! August 17th: McKenna filmed a commercial for a tech company! She will post a link as soon as she’s allowed. August 10th: McKenna performed to a sold out crowd in Bragging Rights at the PIT Striker! Her team was voted the winner by guest judges Luke Null (SNL Season 43 cast member) and Tim Realbuto (writer and actor feature film YES). July 28th: McKenna performed with Room 28 Comedy at the Washington Heights Block Party! July 22nd: McKenna filmed a new webseries with Indelible Films! The series takes place in a real estate office in which McKenna will be playing the receptionist. July 17th: McKenna booked and filmed a commercial for the amazing vegan restaurant, by Chloe. This company has stores in NYC, LA, Boston and London. She was in two spots entitled Plant Curious Film. July 8th: McKenna filmed a sketch with EOP Comedy! July 7th: McKenna booked filmed a Microsoft commercial! She played the Waitress in the spot entitled "Humor Bistro." July 6th: McKenna performed in the SOLD OUT variety show, Comedy Derailed, at the Soho Playhouse! She was so excited to be a part of this all female cast and crew! Yes! June 9th: McKenna hosted Bragging Rights at the PIT Striker! In this show, two hilarious teams go up against each other in a sketch comedy battle! 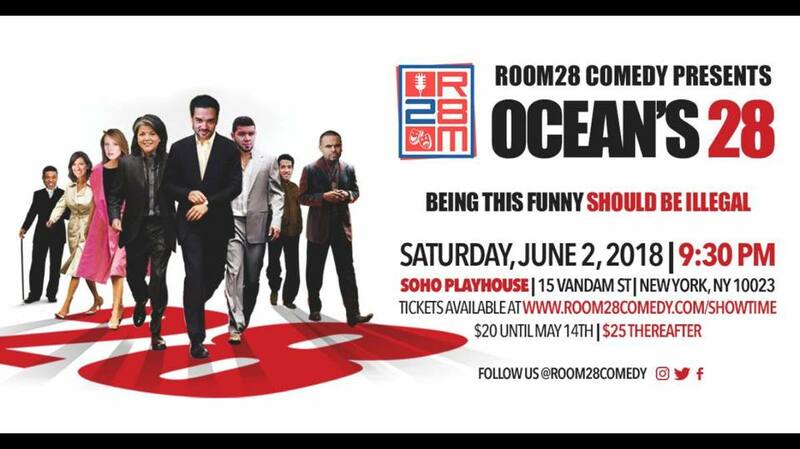 June 2nd: Room 28 Comedy had a great show at the Soho Playhouse! May 18th: McKenna filmed with Saturday Night Live! The pretape was a new sketch called Friendship Song featuring Nicki Minaj, Tina Fey, Kate McKinnon, and many other SNL cast members! May 13th: McKenna attended the New York Indie Film Festival awards ceremony to celebrate the three wins for Latino Vortex! The sketch won Best Ensemble, Best Cinematography, and Best Production Design. May 11th: McKenna shot a pretape with SNL! The sketch is titled The Day You Were Born and it stars Amy Schumer, Mikey Day, Alex Moffett, and Aidy Bryant. McKenna plays a nurse in the delivery room scenes. May 11th: McKenna performed with Room 28 Comedy at the PIT's hit show, Bragging Rights, where she and her team came out victorious! May 2nd: McKenna did a reading at Jersey City Theatre Center of Richard Dresser's new play, Wolf at the Door. Richard's work has been produced all over the country, including Broadway. April 18th: McKenna filmed a promo for the new messaging and gaming app, BLUR. April 13th: McKenna hosted Bragging Rights at the PIT Striker! April 3rd: McKenna was in a reading of Nicole Pandolfo's new play, The Belle of Belmar. The reading was hosted by the Drew University Dramaturgy Department. March 31st: McKenna performed with Room 28 Comedy at the DAF Comedy Festival! March 27th: McKenna performed in a reading of Erin Mallon's play, The Other White Meat, at Mile Square Theatre in Hoboken. Big thanks to the Writers Theatre of New Jersey for holding so many wonderful reading series so that new plays can get seen! March 19th: McKenna was in a reading of John Lewis's new screenplay, Killing Roger. The movie follows the battle of the media during the time of the Kennedy assassination. February 28th: McKenna performed in Erin Mallon's reading of Stunning Displays of Prowess at Jersey City Theatre Center. She was excited to work with director, Mark Cirnigliaro. February 22nd: McKenna performed with Room 28 Comedy at City Tech Brooklyn College! February 9th: McKenna joined the cast of Bragging Rights at the PIT's Striker Theatre for another fun night of completely original sketch comedy! February 8th: McKenna played the role of Chris, a high strung and slightly sadistic daughter, in the delightful comedy, The Happy Family, by Jan Jalenak and directed by Alastair Boag. The readings took place the Robert Moss Theater. February 2nd: McKenna is excited to announce that she has been offered the role of Milly, a small town reporter, in Summer Nights, a new feature film by Peter Iengo! The movie is set to shoot this coming summer in the New York area. January 22nd: McKenna shot a commercial spec with writer and actor, Deborah Napier. January 16th: McKenna was in a reading of The Other White Meat by Erin Mallon at the Dreyfuss Theatre in Madison, NJ. January 9th: McKenna was a part of the Writer's Theatre of New Jersey's 2018 SOUNDINGS Reading Series for the second time this season! This time she read in Donna Hoke's new play, Teach. January 9th: Crazy Famous, the feature film that McKenna shot in 2015 with actors Catherine Curtain and Kathy Searle, is now available On Demand for most cable/satellite platforms and on Amazon! January 2nd: McKenna was excited to start the year off by being a part of the Writer's Theatre of New Jersey's 2018 SOUNDINGS Reading Series. She was included in the cast of The Patriot, written by Pulitzer Prize nominated playwright, Joe Sutton. Joe's previous work has been featured on Broadway and London's West End. Crazy Famous is now available for free on Amazon Prime! 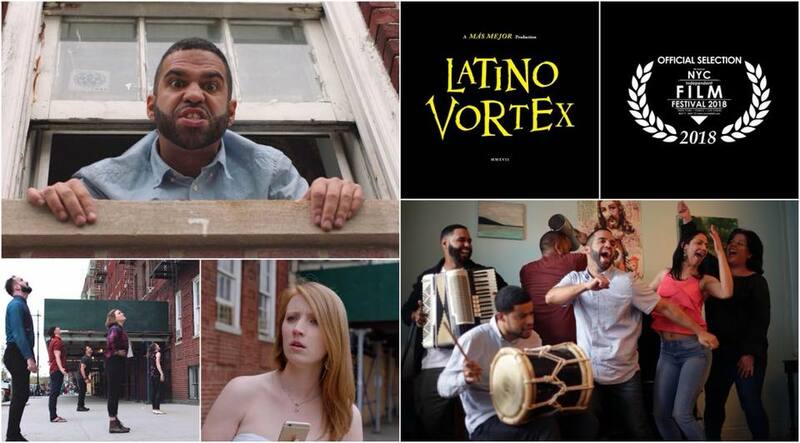 McKenna Cox, Rachel Strauss-Muniz and Mike Diaz receiving the awards for Best Ensemble, Best Cinematography, and Best Production Design for Latino Vortex at the NYC Indie Film Festival. McKenna is the distressed jogger in this promo poster for Smiley Face Killers.